One present I got for my dad this Christmas was a t-shirt with this funny image on it. Perhaps you’ve seen this on a poster or t-shirt before. It’s very amusing. But my dad pointed out a bit of the irony I hadn’t noticed before. For to tell to “be rational” is a bit like the pot calling the kettle black. Can you think why? If you remember what a rational number is, you’ll remember it’s a subset of the real numbers. 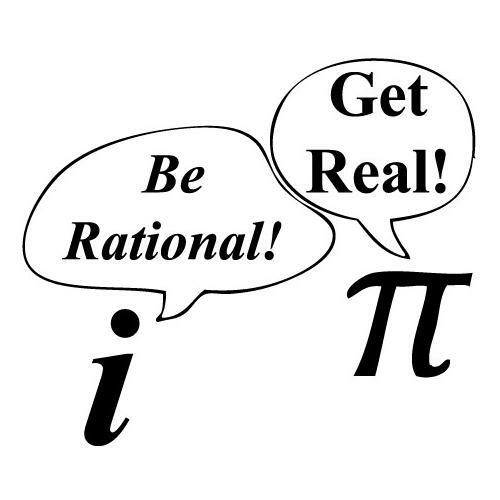 No imaginary number is “rational” in the typical sense. So could just as easily say “be rational” to . That’s your interesting thought for the day. Happy new year! This entry was posted in Complex by Mr. Chase. Bookmark the permalink. Clearly the square root of negative one, as the representative of the complex numbers, believes very strongly that using the word ‘rational’ is such a narrow sense is stigmatizing and marginalizing to complex numbers. Root minus one thinks you should say “the rationals intersect the reals” if you mean rational numbers with imaginary part 0.